Texas Land Commissioner George P. Bush is stepping up to help raise money for a super PAC supporting his dad's likely 2016 presidential campaign. 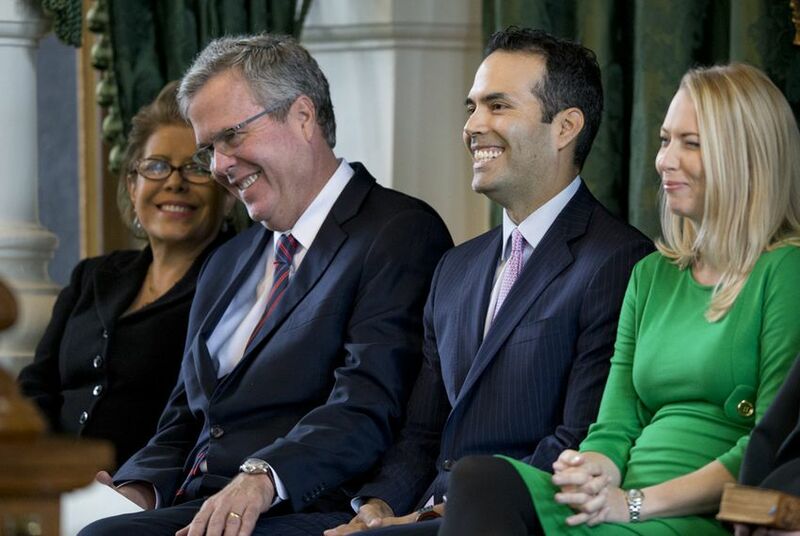 Jeb Bush puts his hand on his son George P. Bush's knee during a light moment in the younger Bush's swearing-in ceremony on Jan. 2, 2015, as Texas land commissioner. At right is George P. Bush's wife, Amanda Bush. Texas Land Commissioner George P. Bush is entering the fray of his dad's already vaunted fundraising machine as the former Florida governor gears up for a 2016 presidential campaign. George P. Bush is headlining a fundraiser Thursday in Austin for the super PAC that can collect unlimited amounts of money to support Jeb Bush if he decides to run for president, according to an invitation. Billed as an event for "young professionals" in Austin, the event also features Jeb Bush Jr., the land commissioner's younger brother. George P. Bush's political shop cautioned against reading too much into his involvement in the fundraiser — a no-brainer given its location in the city where he now spends most his time as as the head of the General Land Office. "Commissioner Bush is not going to be actively involved in any presidential campaign in 2016," said Kasey Pipes, a spokesman for the land commissioner. "He is fully engaged at the GLO, and that’s where his entire focus is." "However, he clearly supports his father and thinks he will be a great president and will help where he can," Pipes added. Jim McGrath, a spokesman for George H.W. Bush — George P. Bush's grandfather — said he sees the fundraiser as a "continuation" of the stumping the land commissioner did for the 2000 and 2004 presidential campaigns of his uncle, George W. Bush. Since then, George P. Bush has carved out his own base of support — particularly among Hispanic voters in Texas — that he can introduce to his dad. "So he's built up his kind of own political identity that kind of carried him to office. He's using that appeal now to try and help his father reach an audience he's been successful with," McGrath said, adding that he is "not the least bit surprised" George P. Bush is pitching in. "He did it for his uncle. Of course he's going to do it for his father — and by the way, he's pretty good at it." During his first trip to Iowa this past weekend as a potential 2016 candidate, Jeb Bush reportedly said "you might see" his son one day in the first-in-the-country presidential caucus state. In addition to serving as a 2016 surrogate, the land commissioner's prominent pedigree already has vaulted him into conversations about his presidential prospects. The fundraiser for Right to Rise super PAC is being hosted at the home of Martha and James Dyess, CEO of Austin-based Horizon Bank SSB. The event costs $50 to attend, $500 to host, $2,500 to sponsor and $5,000 to co-chair, according to the invitation. George P. Bush made some waves last year for not appearing gung-ho about his dad's interest in a run for the White House, declining to endorse him if he ran for president. He later clarified he would support his father if he decided to run and help him out in any way he was asked.